♣ The replacement Ladder Golf Tosses ensure you'll never show up to a tailgate party unprepared. The replacement tosses come in multi-purpose sizes compatible with the majority of golf toss ladders so you can play on any type of ladder golf set. Play ladder golf with your friends and family, at the cabin or on the beach and always keep a replacement set handy in case you lose or damage one of your current tosses. ♣ The replacement Ladder Golf Tosses ensure you'll never show up to a tailgate party unprepared. 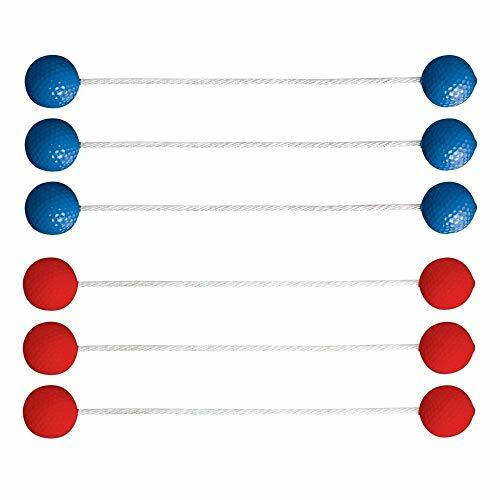 The replacement tosses come in multi-purpose sizes compatible with the majority of golf toss ladders so you can play on any type of ladder golf set. ♣ Play ladder golf with your friends and family, at the cabin or on the beach and always keep a replacement set handy in case you lose or damage one of your current tosses. ♣ Color: 1 Set of Red and 1 Set of Blue! ♣ Great for Everyday Fun! Use for Hillbilly Golf, Redneck Golf, and Ladder Ball!